...a world of electrical connection between conductors and printed circuits boards, a world of automation technology and signal level matching and a world of surge voltage protection. Over 5000 Phoenix employees work in partnership with clients to create innovative products for markets across the world. As a worldwide leader in the manufacturing of industrial automation, interconnection, and interface solutions, the USA subsidiary established headquarters in Harrisburg, PA in 1981. With a national network of distributors, manufacturers representatives and field sales personnel, this facility provides value added and innovative system solutions for a broad-based market. The facility is registered to ISO 9001:2000 the quality system model for quality assurance in design, development production, installation and service. 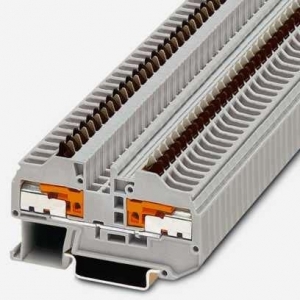 The VTRK 4 has been specially developed for connecting potted safety transformers according to IEC 60742/EN 60742/ DIN VDE 0551-1 for low voltage halogen lamps. The modules are fixed in prescored housing cutouts without additional tools. Cone-shaped guides in the terminal block housing provide a reliable insulation. The product series of the VTRK terminals blocks consists of: VTRK 4 as a feed-through terminal block. VTRK 4-SI as a primary fuse terminal block. VTRK 4-SI/C as a secondary fuse terminal block. All models are additionally available with molded strain relief. Important assembly instructions â€“ increased safety "e" When adding other series and sizes of terminal blocks and using additional accessories, the required air and creepage distances have to be observed. If fixed bridges are used, a cover is necessary between bridges which make direct contact, as well as at the beginning and end of each bridge, in order to maintain the insulation distances. If the fixed bridges are used for creating bridging between non-adjacent terminals, the max. 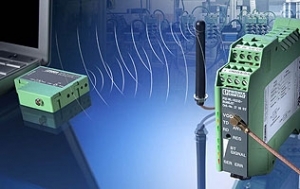 working voltage is reduced to 60 V.
The new PSI-WL Bluetooth (TM) converters from Phoenix Contact are designed for wireless transmission with the serial interfaces RS-232, RS-422 and RS-485. The converters act as a substitute for serial cables in point-to-point or multipoint connection mode. In addition, the devices can be used as an industrial access point for terminal devices that are already Bluetooth-capable, to read operating states via notebook or PDA or to perform programming, diagnosis and parameterization tasks. Unauthorized access is prevented by passwords, applied device lists or the fixed assignment of the Bluetooth (TM) devices to each other. The integrated Bluetooth (TM) path diagnostics showing the signal quality of the wireless connection supports system startup. The transmission capacity over wide ranges can also be adjusted via a supplied software tool in order to adapt the reach of the radio cell to individual requirements. Two device designs are available for assembly on EN mounting rails in the control cabinet or mounting directly onto the serial port on the outside of the control cabinet.